When I was in library school, I took a class on adult readers' advisory. This class was actually really helpful in determining how to recommend a good book to an adult who has finished a book and is looking for a read-alike suggestion. The problem with this class is that it was for adults, and adults are typically more articulate than children as far as being able to explain what they liked about a particular book. Do you remember that book you told us about two weeks ago? Do you have anymore like that one? You know that book you had on your desk? The one about the girl with the hair? Can you recommend me a book? Not a stupid one; you know what I like. Is there any new book that's good? All of these were actual conversations I had with actual children, and in all the cases, I eventually was able to find what it was they were looking for. It took a bit of questioning and guessing; the second question led me to guess Alex Flinn's Towering, then Marissa Meyer's Cress, and finally Shannon Hale's Rapunzel's Revenge (which was the book the child was after). Most adults like to stick with a particular genre, but a kid who likes to read, say, the Origami Yoda books might not know why she likes them - is it because of the Wimpy Kid-esque illustrations, the silly story, the school that resembles her school, or because she just likes everything Star Wars? Maybe she just picked them up because the author's name begins with an A and she picked up the first thing she saw on the shelf. Or maybe she only reads green books, or books that are a part of a series, or books that are not a part of a series. The bottom line is this: to recommend a book to a kid, you've got to like talking to kids, you've got to know the kid you're talking to (or be willing to ask lots of questions to get to know that kid), and you've got to know lots of different books, or at least have access to Goodreads or some other internet "cheat sheet." I did pretty well finding books for the kids at the middle school where I worked, but now that I work with people from birth through age eighteen, I have a wide range of books and authors to keep on the top of my head. 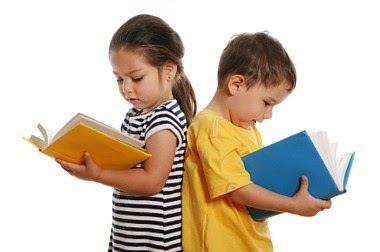 People are more likely to read a book when it is recommended to them by someone who knows them, and kids are more likely to develop a love of reading if they experience a lot of books they love to read. Parrott, Julie. The Cost of Truth. Xlibris Corporation. 2014. $28.03. 228p. SC 9781499000898. This biography of Donna Gordon covers her dramatic transformation from joining the Missionary Franciscan Sisters of the Immaculate Conception in Brisbane to leaving her calling and marrying her first love, giving birth to five children, then realizing that she is a lesbian and coming out of the closet. After leaving her family behind, Gordon was diagnosed with bone cancer. 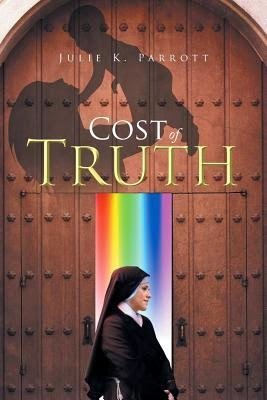 The Cost of Truth details Gordon’s struggles as she battles cancer and attempts to reconcile with her family whose religious beliefs will not allow them to accept her orientation. The first-person narration in this book demonstrates that Parrott has spent much time with Gordon in order to tell her story properly. The story is personal, and the easy, conversational style and slow pace match this perfectly. Unfortunately, the story of a deeply religious person who comes out as LGBT has been told in many other venues already, and most libraries will find the price of this book to be prohibitive. While it is indeed a good thing that Gordon’s story has been told, this book is recommended as a purchase only for the libraries in Gordon’s and Parrott’s hometowns. Other libraries may find Aaron Hartzler’s Rapture Practice or Michelle Theall’s Teaching the Cat to Sit a better investment for their collection. Spoon, Rae and Ivan E. Coyote. Gender Failure. Arsenal Pulp Press. 2014. $17.95. 252p. SC 9781551525365. 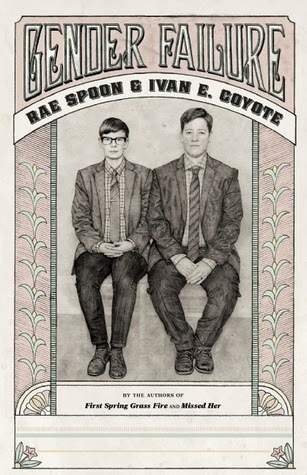 This collection of essays and personal stories is the collaborative work of Ivan E. Coyote and Rae Spoon, both performers, musicians, and writers who admit that they have “failed” at gender. While Spoon has identified as transgender in the past and has now retired their gender altogether, Coyote has chosen to identify as trans* where they used to be identified as a butch lesbian. Both Coyote and Spoon have at times felt like outsiders and are now bringing awareness to the world at large and the LGBT community about those who live off the gender grid. In alternating chapters, this book is a collection of the authors’ essays, song lyrics, drawings, and photographs all describing the their journeys as they have traveled through and beyond the gender spectrum. The essays and stories are personal, poignant, humorous, and bittersweet. They cover a variety of topics, touching on each author’s experience with gender, growing up in Canada, the LGBT community, and other seemingly-mundane topics such as airport restrooms. This book, like the multi-media show it’s based on, demonstrates that gender isn’t a binary thing. As such, Gender Failure is a necessary addition to any LGBT special collection, and is strongly recommended for public libraries, particularly those where there is emphasis on representing diversity within the library’s collection. This is a good example of what I do - I make displays and put them up and hope people look at them. I've already posted about what a school librarian spends his/her day doing, but some people may wonder what a children's librarian does all day. There are probably some well-meaning people who think my entire day is spent reading stories out loud to crowds of red-cheeked cherubs or paging through stacks of picture books and making cute crafts to post on my personal Pinterest page. Desk Time. I sit at either the reference desk or the children's desk for several hours each day. I can work on other things while I'm there, but my primary function at that time is to be a resource for patrons who have questions. Planning. I plan programs - both programs like a story time and also passive programs like "stop by the library and build with LEGO this week." Each of these programs needs to be added to a calendar, put on signage throughout the library, and of course someone has to set it up, clean it up, and run it. Collection development. I help choose books to be added to our library's children's and young adult collections. I remove books that are old, dirty, ripped, or that just don't circulate. I make displays showcasing new books or award-winning books or books about a particular topic, like scary ghost stories for Halloween. Outreach. I visit local schools to talk about the library. I assist in open house events or other outreaches into the community so that people who don't use the library can see what we have to offer them. Administrivia. I answer emails. I fill out time sheets. I read updates and announcements for the library. I answer the phone. Professional Development. I read articles online and in School Library Journal, Library Journal, Booklist, the YALSA website, etc. I attend webinars when possible. I attend in-person workshops as well. I try to keep up on what's new in youth services librarianship. Occasionally I do also flip through new picture books or other books that are added to our collection, but I don't get to sit around and read all day, and I definitely don't spend the whole day reading to groups of cherubs (although if you know someone who has a cherub, please send them to my library - I'd love to read to them!). When I'm out in the library itself, among the public, I answer lots of questions - about how to do something on the computers or how to find a particular book or where the bathroom is. Like most people, children's librarians wear a lot of different hats throughout the day, the main difference being that most of our hats could be found on a Dr. Seuss character. So, librarians out there, what is your favorite part of your job? Himes, Elise. The Trans-fer Student. CreateSpace Independent Publishing Platform. 2014. $9.99. 252p. SC 9781494733445. Rachael and her family have moved to a new town, and Rachael is now attending a private, all-girls school. Once the rumor begins to circulate that one of the new students is transgender, Rachael knows she has to keep her secret deeply hidden. Rachael is terrified that the witch hunt at her school will end with her burning at the stake. There have been more young adult books published with transgender characters recently than ever before, but many of the books center around the trans* teen discovering that s/he is trans* or attempting to come out to his/her family. This book takes a different tack, in that Rachael is already out to her family and is attending a new school in stealth mode. Setting aside the idea that her parents would allow her to present as female and attend an all-girls school but would not seek medical advice or put her on hormone blockers or estrogen, the story’s focus on the ridicule and stress of trying to survive high school reads as genuine. With stock characters that could easily be found in any teen novel or after-school special, this story has a realistic feel, if not a unique one. 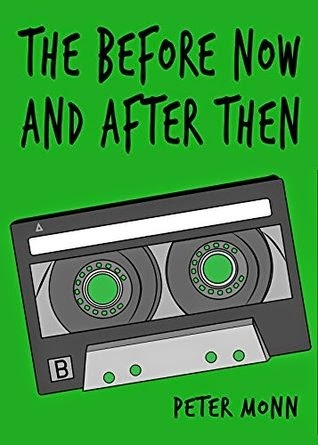 Readers who enjoy high school drama will find the pace perfect and the personal writing style hints that this book may be at least partially autobiographical. With additional editing and a different title, this book would appeal to many teens who enjoy reading problem novels. This novel fills a niche that has not yet been filled at a time when diverse books are desperately needed in young adult literature. Recommended for public and school libraries. Monn, Peter. The Before Now and After Then. Pen Name Publishing. 2014. Donny is reeling after the death of his identical twin, Sam. Same was the golden boy: athletic, intelligent, popular. Now Donny isn't sure where he fits or who he really is. His coming out to his parents and their subsequent divorce have not helped things, either. His new start at a brand-new school is a chance to reinvent himself, and with the help of his new best friend Cher and an adorable boy named Rusty, Donny might actually have a chance to do just that. This book is absolutely a Fault in Our Stars for the LGBT community. There's a love interest, a kid who thinks he's a grenade, a terminally ill person, even the Indianapolis setting is similar. I was glad that Donny had the support that he did in his life and sad for all the tough stuff he's had to deal with. I laughed, I cried, I almost threw my Kindle at the wall at times. And yes, I did Google the Starbucks secret menu afterwards, even though I haven't stopped in to try a new drink yet. Recommended. Be flexible. This refers both to where you want to live and where you want to work. If you only want a job that is walking distance from your house, for example, you're really narrowing your field. I live in a very large metropolitan area, but I still put my commute limit at one hour each way. I knew that it would be possible for me to have a less-than-ideal commute and then eventually move to a better location near the job rather than trying to find a job that was in my neighborhood. I also expanded my personal definition of "library job" to include school library technician jobs, bookstore jobs, etc. I ended up working in a school library where the requirements for my job included only a high school diploma and not an MLS, but it was better than cashiering at a big box store. Keep up with professional development. My school library job required only that I be a glorified circulation monkey. I heard stories of predecessors who were never on campus, who didn't shelve books, or who spent their entire day painting Dungeons and Dragons figurines at the circ desk. In addition to updating the library and increasing circulation, I made sure to spend my time on librarian listservs, reading articles on School Library Journal, Library Journal, and various ALA subsites, and attending as many free webinars as I could. This way, when I was asked what I was doing to keep current on library-related issues at the interview for my actual library job, I had a real answer to give. Look every day. I had a few sites I would use - INALJ for one - but I also made a list of all the nearby towns' library websites and used them to see if any jobs were posted. I applied for every one that came up as soon as I heard about it. Sometimes I would go weeks checking websites without any hits, only to find five new jobs posted on a single day. It's important to apply quickly, though, since many organizations are now employing the "we only read the first 200 applications" technique, so you have to get in quickly or no one will have seen your work. Network. Get to know other librarians. Read their blogs. Stay in contact with people, as it is so much easier to get a job when you have your foot in the door and know the people than if you are a brand-new face for the employer to learn. I got my school library/media technician job last year, and I searched for 15 more months to find a public library job. Having a job with a steady paycheck meant I could search for a new job as the opportunities presented themselves, and if I hadn't landed my new job, I would still be okay. The biggest piece of advice I can give you is don't give up. The jobs are out there, even if they aren't the low-hanging fruit that our library school professors told us they were. Shraya, Vivek. She of the Mountains. Arsenal Pulp Press. 2014. $18.95. 149p. SC 9781551525600. 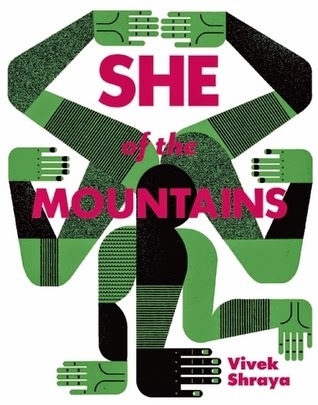 Simultaneously retelling the Hindu story of creation and the story of a boy and the girl he loves, She of the Mountains weaves mythology and reality together until the line blurs and the reader sees both as one story. The main character, referred to only as he, is oblivious to the quite-obvious fact that he is gay. As he becomes aware of his own orientation, the reader also watches the relationship between Parvati, the Hindu mother of the universe; Shiva, the lord of destruction, and Parvati’s son Ganesh. Shraya effectively tells a large story using a small number of pages. This brief tale has merit in both its retelling of Hindu mythology and its story of the love that he and she share. Intentionally ambiguous, this story avoids much of the typical character development and plot devices other stories share. The literary writing style of this short novel will discourage readers used to more standard plot-driven writing; nonetheless Shraya’s work would fit well in an LGBT special collections library or with a collection of Hindu tales. Recommended for academic institutions. Little, Ashley. Anatomy of a Girl Gang. Arsenal Pulp Press. 2014. $16.95. 254p. SC 9781551525297. 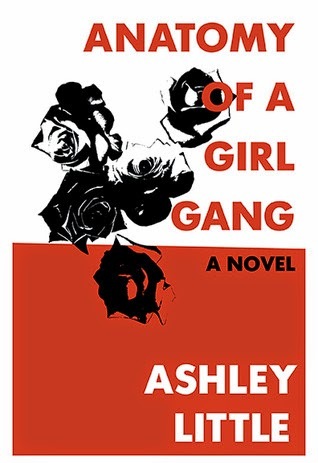 Anatomy of a Girl Gang tells the story of a gang of girls in Vancouver who call themselves the Black Roses. Originally bonded together to make up for what each has lost in her own life, the gang quickly escalates to violence and crime. Told in chapters alternating among the gang members, this urban tale of gang culture will have readers turning the pages even after they’ve guessed at the ending. Little manages a feat few others have done: her narrating characters’ voices read differently from each other. Chapters that tell the same story from different perspectives truly sound different, and Little has managed to capture the voice of an urban gang, the reasons the girls would join, and how the gang devolved into violence. This book has a dark tone, and the gritty writing style perfectly matches the story being told. 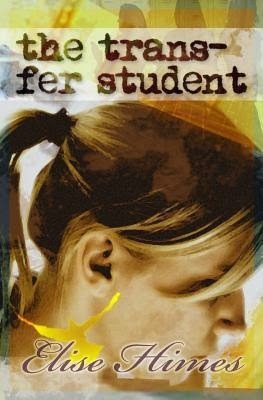 The novel packs an emotional punch and is a recommended read for anyone who works with young adults in urban settings. This book would be a good addition to an adult collection at a public library, but would also do well as a “grown-up” read-alike for S.E. Hinton’s The Outsiders. This is not me, but I am SO jealous of the blue hair. Today I start my brand-new job as a children's librarian with a nearby urban public library. I have been vying for a "real librarian" position since I graduated from library school. Unfortunately, I got caught in one of those "we want you to have library experience so we can hire you for a job where you'll get library experience" cycles and things just didn't work out. I felt lucky to find my position as a library/media technician (LMT) at a local public school, but that job didn't require a college degree (at least, according to the district it didn't) and it didn't pay very well. I loved - LOVED - the kids I was working with and the staff I worked with, and I was able to do some incredible things in that library, but my school bills aren't getting any smaller, and I've grown tired of working multiple jobs just to pay the bills. Four years working 2-3 jobs is a bit much. I've continued applying for full-time, salaried, actual librarian positions while I worked at my school library, and I didn't have any success, really, until recently. I'm not sure what changed, but this summer I had a couple of panel interviews and phone interviews and finally I was in line for a real job. I kept working at my school library job, and on International Talk Like a Pirate Day (which falls in the same week as my birthday), I was offered a new position. I am very excited about starting my new position today and being able to work in the field and with the group for which I trained (and for which I put myself in debt to Sallie Mae). This new job is a definite step up for me. My blog will likely be on hiatus for a few weeks while I adjust to my new position. I am excited about the programs I will be able to share with you, as well as the countless numbers of stories of all the crazy things that will happen with my new kiddos. Lavoie, Jennifer. Tristant and Elijah. Bold Strokes Books. 2014. $11.95. 207p. SC 978162390751. Tristant is an out and proud teen with a very supportive family. He has a crush on Elijah, whom Tristant thinks is straight but is actually deeply closeted. Together, Tristant and Elijah discover a letter written by Tristant’s great uncle, who was a gay man living in the early 1900s when it was much more dangerous to be LGBT. As Tristant and Elijah work together to unravel the mystery of Tristant’s uncle, their relationship with each other begins to bloom as well. This novel is an interesting combination of a character-driven romantic story and a plot-driven historical mystery. The reader learns as much about the Tristant’s uncle as they do about the two main characters. 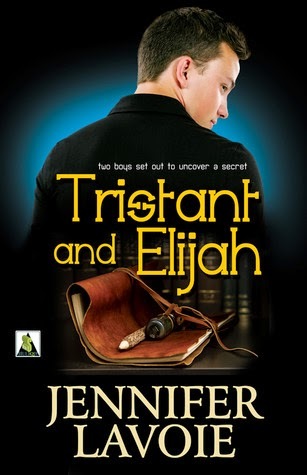 Tristant and Elijah’s relationship develops throughout the story, but an absence of explicit details makes this story an ideal match for young adults and even tween readers who are ready for more mature books without graphic content. The historic information makes this book an easy pair for David Levithan’s Two Boys Kissing. A conversational writing style and character-driven story makes this novel an easy recommend for fans of romance literature, especially boys who may want a romantic story without a female main character. While the lack of friction or difficulties in Tristant and Elijah’s lives may not ring true for most LGBT teens, the presence of a character who is confident in his orientation will be a source of encouragement. Recommended for public and school libraries. Hardesty, Sue. Panic. TRP Cookbooks. 2013. $11.25. 164p. SC 9780979270161. Three very different teenagers travel together into the desert to find Indian artifacts to sell. When their truck breaks down, they must struggle to survive against the dangers of the desert: heat, snakes, lack of water, and panic. 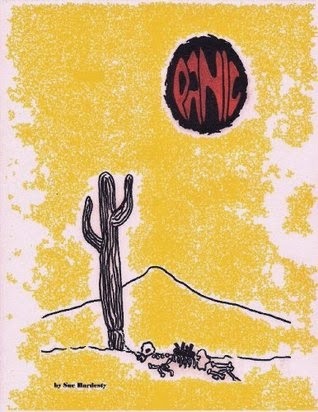 Will the trio make it out of the desert alive, or will they succumb to the deadliest factor of all, panic? With teens as main characters and a survival plot, this book would seem to be an easy sell to a young adult audience. The plot-driven survival story and the trio of very different characters would certainly appeal to teens were the story written in a more compelling style. The simple language of the story and the characters causes the story to feel like an elementary school “first chapter” book, and the sketches and drawings throughout contribute to this juvenile appearance. While weaker young adult readers could definitely benefit from a story written on a lower level, the writing style in this book will not compel them to finish the final page, and the characters will not convince a young adult reader that the author has spent any time around teens. This book will not appeal to the average young adult, and even strong readers may experience difficulty in finding motivation to finish the story. With further editing and an updated, more contemporary cover, this story could appeal to teens who enjoy survival stories. Librarians looking to add more books containing LGBT characters to their collection should instead consider the works of Kristen Cashore or Malinda Lo. 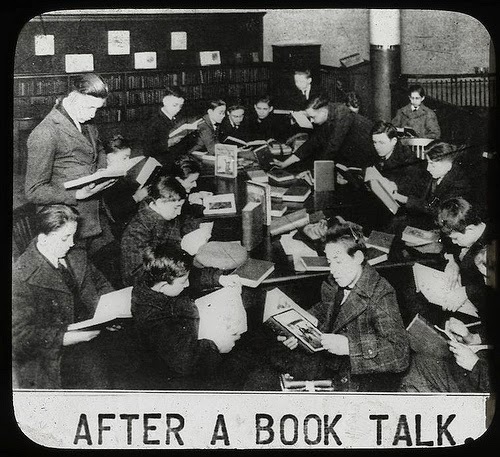 Aside from the dated clothing, my library actually looks a lot like this after a book talk. As a middle school librarian, I have a very small amount of time with each class, and unfortunately I don't see some classes more than two or three times the entire school year. As such, I try to maximize the time I do have with them. We do not have a computer lab where I can teach them research skills, so I spend more of my time talking about books. And let's be honest: middle school is the time when kids stop reading. They don't have time for it anymore, teachers don't prioritize it, and it stops being cool to be the kid with the newest book. I can't transform all of our English/Language Arts classrooms into bastions of free reading, but I can do my best to entice students while they're in the library. When classes do visit the library, I give them a couple of very brief book talks and then let them search for books to check out. Rather than centering my book talks around a theme, I try to find a variety of books. I have many students who are "onlys": that is, they will only read books written in verse, or only read books with a sportsball on the front, or only read books that are part of a dystopian series. Because of this, I always try to book talk at least two brand-new books, at least two books that have multiple copies in the library, at least one book that's the first in a series, and for all of these I try to choose at least three genres so the kids aren't hearing about only science fiction, or romance, or mystery, etc. I also try to make sure I only book talk books I've read, which means I have to read from a wide variety of genres and keep current on the books I know about, too. For example, I might talk about Roland Smith's Peak by saying, "The main character's name is Peak, and he gets in trouble for climbing up the outside of skyscrapers. The adults decide to send him away for a while so no other kids try to mimic him and climb buildings, too, so he's sent to live with his dad. But instead of grounding him or taking away his cell phone, his dad takes Peak on a trip to scale Mount Everest, hoping that Peak will become the youngest person to ever reach the summit." Yes, my students could possibly get that much information from reading the back of the book, but many of them won't be bothered to do so. They will, however, pick up this book and check it out. When I finish my book talks, I always put the books I've discussed on a book cart so students can look at them. Sometimes I sneak read-alikes into the cart, books they might also like but that I didn't have time to discuss with them. When I put Peak on the cart, I added a copy of The White Darkness and a copy of No Summit Out of Sight, and every copy of those three books is currently checked out. Book talking books to the kids has a few added benefits. First, the kids learn that I love books and love to talk about them. This means they are always - and I do mean always - coming up to me and asking what a book is about or telling me about a book they've read or asking for recommendations. Not only that, but giving a book talk and then allowing students to wander and check out books sets the expectation that everyone should be able to find something to read, even if it isn't a 400+ page fantasy tome. I get more kids to check out books when I can show them the wide variety of reading options that are available to them, and book talks are a good way for me to do that. Hopkins, Ellen. 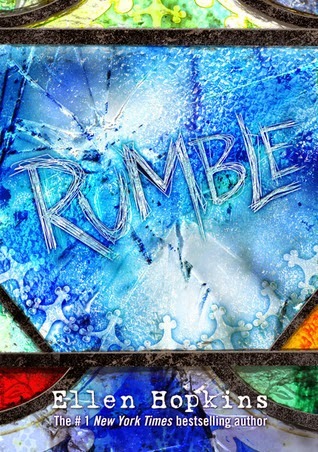 Rumble. Margaret K. McElderry Books, 2014. Matthew doesn't believe in god. He hasn't since his brother committed suicide after incessant bullying by his classmates. Matthew's girlfriend is very religious, and Matthew is dealing with the overwhelming loss of his brother as well as the flak he is getting from his teachers and parents because of his vehement insistence that no god could possibly have created such a terrible world. This book, like much of Hopkins's work, runs the gamut of difficult issues. We have anti-gay bullying, a kid who is angry at everyone and making everyone wonder if he will bring a gun or worse to school, a girlfriend who has let her religious beliefs blind her to what is going on around her, etc. This is not an easy book to read, but books "about kids with real problems" are very popular in my school library, so as long as they are relatively free of red flags, I try to get as many of them as I can. I would describe this story as "messy," but the lives of my students are also messy, so that isn't necessarily a bad thing.